The aggregate market value of the voting and non-voting common equity held by non-affiliates of the registrant, as of June 30, 2015, the last business day of the registrant’s most recently completed second fiscal quarter, was $1,254,535 million based on the closing sale price of the registrant’s common stock as traded on the NASDQ Over the Counter Electronic Bulletin Board on such date of $0.46 per share. As of March 16, 2016, there were 21,845,927 shares of common stock outstanding. Portions of Legacy Education Alliance, Inc.'s proxy statement for the 2016 Annual Meeting of Shareholders are incorporated by reference in Part III. Certain statements and information in this Annual Report on Form 10-K under the headings “Business,” “Management’s Discussion and Analysis of Financial Condition and Results of Operations,” “Financial Statements and Supplementary Data” and elsewhere contain forward-looking statements within the meaning of the Private Securities Litigation Reform Act of 1995. We may also make written or oral forward-looking statements in our periodic reports on Forms 10-Q and 8-K, in press releases and other written materials and in oral statements made by our officers, directors or employees to third parties. Statements that are not historical facts, including statements about our beliefs and expectations, are forward-looking statements. Forward-looking statements are often characterized by the use of words such as “believes,” “estimates,” “expects,” “projects,” “may,” “intends,” “plans” or “anticipates,” or by discussions of strategy, plans or intentions; including, but not limited to, our discussions regarding the introduction of additional brands into the U.S. market (e.g., The Independent Woman, Women in Wealth, Brick Buy Brick, and Elite Business Star™ ) which are expected to grow and diversify our U.S. revenue; the development of online courses which are expected to add significant revenue growth; projections of strong international growth, particularly in SE Asia; expected cost savings from symposium fulfillment experience that should lead to increased margins; shortening of course package contracts that should accelerate revenue recognition; and the estimates and matters described under the caption “Item 7. Management's Discussion and Analysis-Results of Operations-Outlook” and “Item 7. Management's Discussion and Analysis-Results of Operations-Recent Developments”. Our assumptions used for the purposes of the forward-looking statements represent estimates of future events and are subject to uncertainty as to possible changes in economic, legislative, industry, and other circumstances, including the development, acceptance and sales of our products and our ability to raise additional funding sufficient to implement our strategy. Such forward-looking statements involve assumptions, known and unknown risks, uncertainties, and other important factors that could cause the actual results, performance or our achievements, or industry results, to differ materially from historical results, any future results, or performance or achievements expressed or implied by such forward-looking statements. There are a number of risks and uncertainties that could cause our actual results to differ materially from the forward-looking statements contained in this report. Important factors that could cause our actual results to differ materially from those expressed as forward-looking statements are set forth in this report and in our other filings with the Securities and Exchange Commission. There may be other factors of which we are currently unaware or that we deem immaterial that may cause our actual results to differ materially from the expectations we express in our forward-looking statements. Although we believe the assumptions underlying our forward-looking statements are reasonable, any of these assumptions, and, therefore, also the forward-looking statements based on these assumptions could themselves prove to be inaccurate. We were incorporated on November 23, 2010 in Nevada under the name Streamline Resources, Inc. Our name was subsequently changed to Priced In Corp. on April 24, 2012. Prior to the merger discussed below, we were a shell corporation with nominal operating activity. On November 10, 2014, we entered into an Agreement and Plan of Merger dated as of such date the (“Merger Agreement”) by and among (i) Priced In Corp., a Nevada corporation (“PRCD”), (ii) Priced In Corp. Subsidiary, a Colorado corporation and a wholly-owned subsidiary of PRCD (“PRCD Sub”), (iii) Tigrent Inc., a Colorado corporation (“TIGE”), and (iv) Legacy Education Alliance Holdings, Inc., a Colorado corporation and a wholly-owned subsidiary of TIGE (“Legacy Holdings”). On November 10, 2014, pursuant to the Merger Agreement, PRCD Sub merged with and into Legacy Holdings (the “Merger”), with Legacy Holdings surviving the Merger and becoming our wholly owned subsidiary and we acquired the business of Legacy Holdings. ● All of the shares of common stock, par value $0.01 per share, of Legacy Holdings outstanding at the Effective Time were converted and exchanged into 16,000,000 shares of our common stock, par value $0.0001 per share (“Common Stock”), and are held by TIGE. As a result of the Merger, TIGE owned approximately 80% of Legacy with the then remaining outstanding shares (3,997,500) held by the existing PRCD shareholders. There was no cash consideration exchanged in the Merger. In accordance with the terms and conditions of the Merger Agreement, PRCD agreed to pay TIGE taxes and related liabilities and other specified costs and expenses, including certain administrative and related expenses that have been or will be from time to time incurred by TIGE that are related to TIGE’s investment in PRCD (including the cost of preparing and distributing reports regarding our business and financial condition to its shareholders), its administrative costs and expenses, and taxes, other than income taxes arising from dividends or distributions by us to TIGE. All shares of PRCD common stock issued in connection with the Merger are restricted securities, as defined in paragraph (a) of Rule 144 under the Securities Act of 1933, as amended (the “ Securities Act ”). Such shares were issued pursuant to an exemption from the registration requirements of the Securities Act, under Section 4(a)(2) of the Securities Act and the rules and regulations promulgated thereunder. The Merger was accounted for as a “reverse merger” and recapitalization since, immediately following the completion of the transaction, the holders of TIGE’s stock had effective control of PRCD. In addition, TIGE controls the surviving entity through control of Legacy’s Board of Directors as a result of the appointment of the existing directors of Tigrent to the four board seats of Legacy. Additionally, all of TIGE’s officers and senior executive positions continued on as management of the surviving entity after consummation of the Merger. For accounting purposes, Legacy Holdings was deemed to be the accounting acquirer in the transaction and, consequently, the transaction was treated as a recapitalization of PRCD. Accordingly, Legacy Holdings’ assets, liabilities and results of operations became the historical financial statements of the registrant, and the Company’s assets, liabilities and results of operations were consolidated with PRCD effective as of the date of the closing of the Merger. Prior to the Merger, PRCD was a “shell” corporation with nominal assets, liabilities and operating activity. No step-up in basis or intangible assets or goodwill was recorded in this transaction. For a further discussion of the Merger and its effects on our business, please see the information contained in our Current Report on Form 8-K, filed on November 10, 2014 and the related amendments thereto. This Form 10-K includes financial statements and related notes that present the consolidated financial position, results of operations, comprehensive income (loss), and cash flows of Legacy and its subsidiaries. Our objective is to be the leading global provider of services and products that enable individuals from all walks of life, regardless of their current economic situation and education background, to take control of their financial futures and enable them to achieve financial freedom. ● Continued development of our U.S. businesses. We will continue our focus on U.S. service offerings in an attempt to improve our revenue and expand our offerings as appropriate, including e-learning and other electronic format offerings and the development of new brands. ● Development of our International market. We continued our expansion internationally which began in 2014, when we expanded our footprint from four countries to 21 countries in Africa, Europe, and Asia, and in 2015, this expansion continued as we added five more countries to our footprint. We opened new offices in South Africa and Hong Kong to facilitate our international expansion. ● Security and longevity of our brands. Internationally, we operate under eight different brands. This provides us the flexibility to provide our services through different demographics, price points and sales channels. This strategy of going to market with multiple brands allows us to protect the individual brands and to provide brand diversification if a particular brand enters a difficult phase. This strategy also allows us to manage individual brand-fatigue while maintaining overall market share and meeting competition. ● Increasing the number of symposiums we hold globally, which we believe will play a significant role in our business model going forward. Symposiums allow us to hold multiple Elite classes in one location resulting in cost savings based on economies of scale. These events have been well received by our customers, providing them with networking opportunities as well as bonus events and activities that have enhanced their experience. ● Enhanced eLearning. We intend to continue developing and promoting interactive and online distributed course content and enhanced technology platforms capable of streaming video, interactive e-learning, and distributed e-learning. We have been developing our social and brand presence internationally. ● Consistent quality assurance. We believe that to be an effective provider of training we need to ensure that our course offerings meet our strict quality assurance guidelines. We will continue to monitor and enforce standards for marketing, sales presentations, and training delivery throughout our organization. ● Continued professional development. We will continue to identify, recruit and retain a team of trainers, mentors and coaches who possess practical, hands-on experience in their areas of expertise. We have introduced several new brands into the U.S. market, including The Independent Woman, Women in Wealth, and Brick Buy Brick, and in January 2016, we announced the launch of the Elite Business Star™ brand. Created in association with entrepreneur Kevin Harrington, one of the original Sharks from the television show Shark Tank, Elite Business Star is designed to help individuals grow their businesses. In February 2016, we announced the signing of former NFL player Phillip Buchanon as a spokesperson for Brick Buy Brick and who has become an Elite Legacy Education student. We believe these new brands will grow our revenue while diversifying our revenue sources. Additionally, our development of online courses is expected to add significant revenue growth going forward. The development of online courses should also reduce expired contracts, as students will have more options for taking their courses, which should accelerate revenue recognition. Countries in SE Asia have reported the fastest growth in e-learning-based education, with this growth rate estimated at approximately 17.0% over the next five years. We continued our expansion internationally which began in 2014, when we expanded our footprint from four countries to 21 countries in Africa, Europe, and Asia, and in 2015, this expansion continued as we added five more countries to our footprint. We opened new offices in South Africa and Hong Kong to facilitate our international expansion. We are also developing courses in entrepreneurship, along with country-specific courses as we expand internationally. These initiatives will likely lead to decreased income in the short term and require a material amount of investment and incurrence of operating expenses. Our students pay for courses up-front or through payment agreements with independent third parties, and under U.S. generally accepted accounting principles (“GAAP”), we recognize revenue when our students take their courses. Over the past 18 months we have taken steps to shorten many of our course contracts from two-year contracts to one-year contracts, which is expected to accelerate revenue recognition as services are delivered faster and/or contract terms expire sooner. We are also utilizing a symposium style course delivery model wherein we hold multiple Elite courses in one location. Using one location allows us to achieve certain economies of scale that reduce costs and improve margins, as well as enhance the student experience. In addition to our Elite courses, we offer one-on-one mentoring (two to four days in length, on site or remotely) and telephone mentoring (10 to 16 weekly one-on-one or one-on-many telephone sessions) that provide a richer experience for our students. Mentoring involves a subject matter expert visiting the student in person and guiding the student, for example, through his or her first real estate transaction, providing a real hands-on experience. We manage our business in four segments based on geographic location. 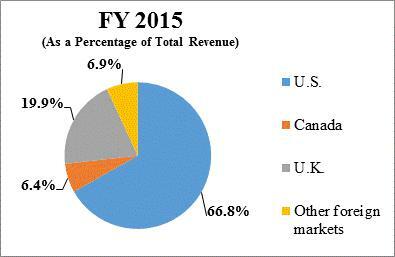 These segments include our historical core markets of the United States, Canada, and the United Kingdom, with the fourth segment including all other international markets. In 2014, we expanded our footprint to include Africa, Europe, and Asia, holding events in 21 countries. As we’ve established traction in these markets, we have moved forward on opening offices in South Africa and Hong Kong during the first six months of 2015. See the caption Revenue, in “Item 7. Management's Discussion and Analysis of Financial Condition and Results of Operations", for further information. ● Rich Dad Stock Education: In our Rich Dad Stock Education program, we teach students how to become savvy investors that can potentially create winning trades and profits in any market condition through the development of personal trading plans that are compatible with their current financial situation, the level of risk they are comfortable with, and their long-term financial goals. ● Making Money from Property with Martin Roberts: A property-based curriculum focused on how and why to buy property at auction in the U.K. Based on the teachings of Martin Roberts, renowned U.K. TV personality, property expert, journalist, and author of Making Money from Property, our Making Money from Property program is designed to show investors tested strategies to buy at auction, as well as the difference between income and capital growth strategies, negotiating transactions, and buying properties overseas. ● Brick Buy Brick: Initially launched in the UK, Brick Buy Brick is now also available in the U.S., Canada and the other international markets in which we operate. The program introduces our students to the tools and strategies used by successful investors to make money work for them through real estate investing. ● Building Wealth™: A program that offers students training on how to build and preserve wealth, start or manage a business, and benefit through investing in property regardless of market conditions. ● Robbie Fowler Property Academy: Designed to teach investment strategies individuals can use to achieve a potential clear path towards long-term wealth, the goal of our Property Academy training program is to provide a comprehensive property investment education. We teach our students the investment strategies currently implemented throughout the UK, such as Social Housing, Buy-To-Let, Lease Options, and Land Development. ● Women In Wealth: Created to inspire women of all ages and backgrounds to potentially achieve financial security, Women In Wealth seeks to empower women with a strong financial education and help them learn the potential benefits of real estate investing to create cash flow and build financial independence. ● The Independent Woman: Developed by women for women, based on the teachings and principles of Kim Kiyosaki, investor, entrepreneur, and bestselling author of Rich Woman and It's Rising Time, The Independent Women program imparts the principles and strategies essential for potential financial independence. ● Trade Up Investor Education: Built on the belief that a successful investor is an educated investor and developed in partnership with Investor's Business Daily®, a leading financial news and research organization since 1984, students are offered educational training designed to help them increase their knowledge of stock and options trading. ● Elite Business Star: Created in partnership with entrepreneur Kevin Harrington, one of the original Sharks from the television show Shark Tank, Elite Business Star is designed to help individuals grow their business through a variety of business strategies including marketing, asset protection, and business financing. Our Rich Dad brands, along with our other brands, are the foundation for our marketing efforts. These brands provide credibility and sustainability within our media mix to promote live events and online trainings. Live onsite two-hour preview events are offered weekly in four to six markets in the U.S., Canada and the U.K. Marketing these events is primarily done online through banner ads, text ads, and emails. Direct mail, radio, television, public relations, social media and print advertising are also used to obtain event registrations. We enter into marketing and other agreements with other organizations to market our products and services to the public internationally. We offer people the opportunity to attend a free preview event or they can advance directly to one of our three-day basic training classes. People who enroll and attend the basic training class receive reference materials relevant to the subject matter to be taught at the class. The basic training course is usually held over a weekend within two to four weeks of the initial free preview workshop. Our experience is that offering the free preview as a first step, is an effective way to introduce to our students the methodology of investing, as well as to market and sell our three-day basic training courses. Marketing efforts continue to those customers who choose to continue their education with a three-day basic training class. Welcome letters, product kits that include manuals, books and audio files, an online reference library, and reminder communication letters are all branded for consistency and credibility. Customers at the three-day basic training may choose to continue on with their education through our elite training classes and mentorships offered during the basic training classes. Elite training classes are fulfilled through various delivery methods to meet the needs of our customers. We have re-branded our Elite division from Rich Dad Education to Elite Legacy Education to expand our market reach. As a result of these re-branding efforts, we utilize multiple front end brands to market into our Elite division but Rich Dad will remain the primary marketing channel for attracting customers to our Elite courses in the U.S.
We also market for new customers who prefer to learn online and provide people the opportunity to attend free ninety-minute live online webinars that are held weekly on six different topics. Webinars are marketed via online banner ads, affiliate marketing, email campaigns, social media and other media methods. Customers can also skip the entry-leveled free webinars to attend paid online trainings that utilize similar marketing methods to attract attendees. Through strategic partners, customers can purchase a license to use supporting software for real estate, financial markets investing or Elite Business Star software. With either software program, a subscription-based data service is available for purchase which allows customers to interactively determine investment options and make better informed decisions about potential investments. We offer live, real time, one-on-one mentoring for Real Estate, Business and the Financial Markets that are tailored to meet students’ individual goals and needs. Real Estate mentoring is offered on site at the student’s chosen location, while Financial Market mentoring can be provided either on-site or remotely. Mentoring is intended to give the student a professional assessment of his or her individual goals and experience and to help the student build an investment plan that can be put into action. Mentoring sessions are generally 2 to 4 days in length. Coaching programs are typically sold in a number of different subject areas and generally delivered in 10 to 16 weekly one-on-one telephone sessions. Some of the topics include Real Estate Coaching, Financial Markets Coaching and Business Coaching. A set curriculum approach is generally used. Each module comes with assignments, exercises and reading materials to be completed between sessions. We manage our business in four segments based on geographic location. These segments include our historical core markets of the United States, Canada, and the United Kingdom, with the fourth segment including all other international markets. In 2014, we expanded our footprint when we expanded from four countries to 21 countries. As we’ve established traction in these markets, we opened new offices in South Africa and Hong Kong to facilitate our international growth. During our more than 20-year history, we have competed with a number of organizations within the U.S. and internationally. Our primary competitors are Fortune Builders, Armando Montelongo, Zurixx, Dean Graziosi, Flip Advantage, Flipping Formula, Winning the Property War, Yancey Co, Nick Virtucci and Success Resources. Some of these competitors have established brands through a media-based relationship, such as HGTV, and use television programs to promote their brands. We believe that Success Resources is our only significant global competitor in the large event business. We have a strong relationship with this company through our U.K. operations and have worked closely with them on various ventures. We believe that the range and depth of our course offerings, the quality of our trainers and reference materials are comparable or superior to those of our competitors. Typically, our trainers for our Elite courses have been active investors in their chosen field, have been trained by us and, to a large degree, are previous customers of our programs. Trainers for our Elite courses are chosen based on their knowledge and experience with the coursework covered, and are further qualified by meeting knowledge standards developed internally. Effective September 1, 2013, we entered into new licensing and related agreements with RDOC (collectively, the “2013 License Agreement”) that replaced the 2010 Rich Dad License Agreement. The initial term of the 2013 License Agreement expires August 31, 2018, but continues thereafter on a yearly basis unless one of the parties provides timely notice of termination. The 2013 License Agreement broadened the field of use to include real estate investing, business strategies, stock market investment techniques, stock/paper assets, cash management, asset protection, entrepreneurship and other financially-oriented subjects. The 2013 License Agreement also (i) reduces the royalty rate payable to RDOC compared to the 2010 Rich Dad License Agreement; (ii) broadens the Company’s exclusivity rights to include education seminars delivered in any medium; (iii) eliminates the cash collateral requirements and related financial covenants contained in the 2010 Rich Dad License Agreement; (iv) continues our right to pay royalties via a promissory note that is convertible to preferred shares upon the occurrence of a Change in Control (as defined in the 2013 License Agreement); (v) eliminated approximately $1.6 million in debt from our consolidated balance sheet as a result of debt forgiveness provided for in the agreement terminating the 2010 Rich Dad License Agreement; and (vi) converted another approximately $4.6 million in debt to 1,549,882 shares of our common stock. On April 22, 2014, we entered into an agreement with RDOC to settle certain claims we had against RDOC, Robert Kiyosaki, and Darren Weeks arising out of RDOC’s, Kiyosaki’s, and Weeks’s promotion of a series of live seminars and related products known as Rich Dad:GEO that we alleged infringed on our exclusive rights under the 2013 License Agreement between the Company and RDOC (the “GEO Settlement Agreement”). In the GEO Settlement Agreement, RDOC, Kiyosaki, and Weeks agreed to terminate any further activity in furtherance of the Rich Dad:GEO program. In addition, RDOC agreed, among other things, to (i) amend the 2013 License Agreement to halve the royalty payable by us to RDOC to 2.5% for the whole of 2014, (ii) cancelled approximately $1.3 million in debt owed by us to RDOC, and (iii) reimburse us for the legal fees we incurred in the matter. In addition, RDOC’s right to appoint one member of our Board of Directors previously continued under the 2013 License Agreement was cancelled. The 2013 License Agreement and the GEO Settlement Agreement were assigned to our wholly owned subsidiary, Legacy Education Alliance Holdings, Inc. on September 10, 2014. We entered into a Talent Endorsement Agreement with an effective date of January 1, 2013 with Robbie Fowler that supplements and earlier November 2, 2012 Agreement with Mr. Fowler (collectively, the “Fowler License Agreement”). The Fowler License Agreement grants us the exclusive right to use Robbie Fowler’s name, image, and likeness in connection with the advertisement, promotion, and sale in the United Kingdom of a property training course developed by us. The term of the license is scheduled to expire on January 1, 2015, but may be extended upon the mutual consent of the parties. Under the Fowler License Agreement, we pay Mr. Fowler a royalty on revenues realized from the sale of Robbie Fowler-branded property courses and affiliated products, after deductions for value added taxes, returns and refunds. In 2009, we entered into a Talent Endorsement Agreement with Martin Roberts that grants us the exclusive right to use Martin Robert’s, name, image, and likeness, as well as well as the rights to use the name of Mr. Roberts’s published book entitled “Making Money From Property”, in connection with the advertisement, promotion, and sale in the United Kingdom of a property training course developed by us. The term of the license will continue unless (i) terminated by one party upon the event of a default of the party, or (ii) by either party without cause upon thirty (30) days prior written notice to the other party. Under the License Agreement with Mr. Roberts, we pay Mr. Roberts a royalty on revenues realized from the sale of Robbie Fowler-branded property courses and affiliated products that are collected within thirty (30) days after a Company-sponsored Martin Roberts-branded event, after deductions for value added taxes, banking charges, returns, refunds, and third party commissions. For sales to clients introduced to us directly by Mr. Roberts and his associated websites as well as other marketing and promotional activities Mr. Roberts or his associated companies may wish to undertake from time to time that are not part of a Company sponsored event and which result in the sale of ours basic training her marketing and promotional activities, Mr. Roberts is entitled to 50% of gross revenue from such sales of directly introduced clients. As of December 31, 2015 we had approximately 208 full-time employees of whom 168, or 81%, were located in the U.S. and the remaining 19% were located in the United Kingdom, Canada, South Africa or Hong Kong. In addition, we employ part-time employees in various capacities and independent contractors who are trainers, coaches or mentors. Our employees are not represented by a labor union, and we believe our relations with our employees are satisfactory. Our independent contractors are either paid commissions based upon the dollar value of the courses purchased by customers at our free preview workshops and basic training courses, or are paid fixed fees for teaching and mentoring Elite courses. Independent contractors are required to execute agreements with us that set forth their commission structures and contain customary confidentiality and non-competition provisions. We electronically file reports with the Securities and Exchange Commission (SEC), including annual reports on Form 10-K, quarterly reports on Form 10-Q, current reports on Form 8-K, and amendments to such reports. The public may read and copy any materials that we file with the SEC at the SEC’s Public Reference Room at 100 F Street, N.E., Washington, D.C. 20549. The public may obtain information on the operation of the Public Reference Room by calling the SEC at 1-800-SEC-0330. The SEC also maintains an internet site that contains reports and information statements, and other information regarding issuers that file electronically with the SEC at http://www.sec.gov. Additionally, information about us, including our reports filed with the SEC, is available through our web site at http:// www.legacyeducationalliance.com. Such reports are accessible at no charge through our web site and are made available as soon as reasonably practicable after such material is filed with or furnished to the SEC. Our website and the information contained on that site, or connected to that site, are not incorporated by reference into this report. We are the sole beneficiary of a land trust that owns the land and building of our executive offices in Cape Coral, Florida. James E. May, our Executive Vice President and General Counsel, serves as the trustee. Our executive office building is approximately 40,734 square feet and is situated on approximately 4.5 acres. We lease approximately 6,294 square feet of office space in Salt Lake City, Utah for our U.S. operations and telemarketing headquarters. The lease expires in November 2018 and rent is payable monthly at rates increasing from $8,890 to $10,306 over the term of the lease. We lease approximately 5,100 square feet of office space in Ontario, Canada for our Canadian headquarters. The lease expires in February 2019 and rent is payable monthly at rates increasing from approximately $3,000 to $3,600 over the term of the lease. We lease approximately 4,226 square feet of office space which is used for both corporate administration and training purposes in Richmond, Surrey. We lease various rooms in the same facility with different lease terms expiring between May 2015 and February 2017. The total monthly rent is approximately $69,460. We believe that our facilities are adequate for our current purposes. See Note 15— Commitments and Contingencies in the Notes to Consolidated Financial Statements contained in Part II, Item 8 of this Annual Report for information about legal proceedings in which we are involved. Our shares of Common Stock are quoted on the OTCQB Market under the symbol LEAI. Prior to our Merger, our shares were quoted on the OTCQB Market under the symbol PRCD commencing on April 7, 2014. The following table shows the high and low bid prices of our common stock for the periods indicated. These quotations reflect inter-dealer prices, without retail mark-up, markdown or commissions, and may not represent actual transactions. As of December 31, 2015, there were approximately 82 stockholders of record for our Common Stock. The number of stockholders does not include beneficial owners holding shares through nominee names. We have not paid out any cash dividends for the past two years and do not anticipate paying any cash dividends on our Common Stock for the foreseeable future. The Company’s 2015 Equity Plan (the “2015 Incentive Plan”) was approved by the stockholders at our annual meeting of stockholders on July 16, 2015. The 2015 Incentive Plan reserves 5,000,000 shares of our Common Stock for stock options, restricted stock, and a variety of other types of equity awards. The text of the 2015 Incentive Plan is included in the attachment marked as Appendix B to the Company’s Proxy Statement on Schedule 14A filed with the Securities and Exchange Commission on June 16, 2015. The financial activity pertaining to our employees and directors under the 2015 Incentive Plan is reflected in our consolidated financial statements, presented herein. We closed a private offering of 959,924 units (“Units”) at a gross price per Unit of $0.55, in June 2015. Each Unit included one share of common stock, par value $0.0001 per share (“Common Stock”), and a three-year warrant (a “Warrant”) to purchase one share of Common Stock at an initial exercise price per share equal to $0.75, subject to adjustment for certain corporate transactions such as a merger, stock-split or stock dividend and, if the Company does not continue to be a reporting company under the Securities Exchange Act of 1934 during the two-year period after closing, the exercise price will be reduced to $0.01 per share. Each Unit includes limited registration rights for the investors for the shares of Common Stock and the shares of Common Stock that would be issued upon the exercise of a Warrant (“Underlying Shares”) when and if we register our shares of Common Stock in a different offering, subject to certain excluded registered offerings. We paid placement agent cash fees of 13% or $68,785 of the aggregate proceeds that was received and will pay 5% of all amounts received upon the exercise of the Warrants. We also issued to the placement agent warrants to purchase shares of Common Stock equal to 10% of the total shares sold in the offering, or 95,992 shares, at an initial exercise price of $0.75 per share. The value of the warrants was $14,866. We had previously received $459,173 in net cash proceeds related to this private offering, which was recorded in restricted cash and other accrued expenses on our Condensed Consolidated Balance Sheets in the first quarter of 2015. The $459,173 in net cash proceeds is now recorded in Cash and cash equivalents and the placement agent fees and the fair value of the warrants were offset against the proceeds in Additional paid-in capital on our Consolidated Balance Sheets. In connection with this private offering, our placement agent agreement with the placement agent was terminated. We described this sale of Units in Part II. Other Information, Item 2 in our Quarterly Report on Form 10-Q for the quarterly period ended March 31, 2015 that was filed with the Securities and Exchange Commission. The offering of the Units was made in a transaction that is exempt from the registration requirements of the Securities Act of 1933, as amended (the “Securities Act”), pursuant to Section 4(a)(2) thereof and the provisions of Regulation D that is promulgated under the Securities Act. The following discussion and analysis of our financial condition and results of operations for the periods indicated should be read in conjunction with our consolidated financial statements, related notes and the other financial data included elsewhere in our Annual Report on Form 10-K. This discussion contains forward-looking statements reflecting our current expectations that involve risks and uncertainties. Our actual results and the timing of events may differ materially from those contained in these forward-looking statements due to a number of factors, including those discussed in this Annual Report on Form 10-K.
We are a provider of practical, high-quality, and value-based educational training on the topics of personal finance, entrepreneurship, real estate and financial markets investing strategies and techniques. Our programs are offered through a variety of formats and channels, including free-preview workshops, basic training classes, symposiums, telephone mentoring, one-on-one mentoring, coaching and e-learning. primarily under the Rich Dad® Education brand (“Rich Dad”) which was created in 2006 under license from entities affiliated with Robert Kiyosaki, whose teachings and philosophies are detailed in the book titled, Rich Dad Poor Dad. In addition to Rich Dad, we market our products and services under a variety of brands, including Martin Roberts, The Independent Woman, Women in Wealth and Brick Buy Brick. Our products and services are offered in the United States, Canada, the United Kingdom, and other international markets. ● Brick Buy Brick: Initially launched in the UK, Brick Buy Brick is now also available in the U.S. Canada and the other international markets in which we operate. The program introduces our students to the tools and strategies used by successful investors to make money work for them through real estate investing. 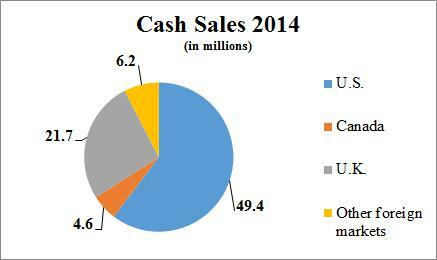 Cash sales were $94.1 million for the year ended December 31, 2015 compared to $81.9 million for the year ended December 31, 2014, an increase of $12.2 million or 14.9%. We believe that cash sales are the best metric to determine our operating performance, as revenue from expired contracts and course attendance can show some volatility and time lag. We anticipate cash sales to increase throughout 2016 and 2017, particularly as new brands gain greater traction in our more established markets, and as we expand internationally and hone our selling and marketing strategy in new markets. Over the past several years, our U.S. business shifted its focus to consist primarily of Rich Dad™ Education brand offerings. Revenue derived from the Rich Dad brands was $54.6 million and $68.4 million or as a percentage of total segment revenue was 93.7% and 97.0% for the years ended December 31, 2015 and 2014. The majority pertained to real estate-related education, with the balance pertaining to financial markets training. We are continuing to develop non-Rich Dad brands, such as The Independent Women, Woman in Wealth, Brick Buy Brick, Elite Business Star™ and others to diversify our business, although our business to date in these brands has not been material to our Company as a whole. The segment revenue was $58.3 million and $70.5 million or as a percentage of total revenue was 66.8% and 73.1% for the years ended December 31, 2015 and 2014. The decrease was due to the decline in recognition of revenue of $14.1 million or 70.6%, due to the change in our revenue recognition policy with regards to DVD fulfillment partially offset by increased attendance (i.e. fulfillment) of $1.9 million or 4.6% in 2015 compared to 2014. 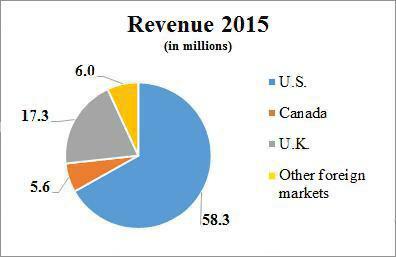 Similar to the U.S., our Canadian segment's revenue primarily consist of Rich Dad branded offerings. Revenue derived from the Rich Dad brands was $5.1 million and $5.8 million or as a percentage of total segment revenue was 90.7% and 95.6% for the years ended December 31, 2015 and 2014. The majority pertained to real estate-related education, with the balance pertaining to financial markets training. The segment revenue was $5.6 million and $6.1 million or as a percentage of total revenue was 6.4% and 6.3% for the years ended December 31, 2015 and 2014. 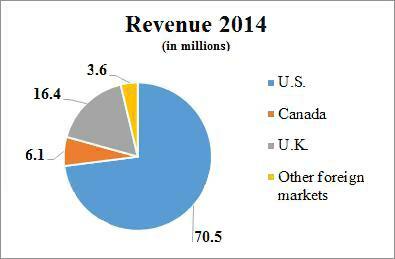 In contrast to our U.S. and Canadian segments, our U.K. segment is more diversified among several different brands. Revenue derived from the Rich Dad brands was $7.1 million and $8.1 million or as a percentage of total segment revenue was 40.8% and 49.7% for the years ended December 31, 2015 and 2014. The majority pertained to real estate-related education, with the balance pertaining to financial markets training. The segment revenue was $17.3 million and $16.4 million or as a percentage of total revenue was 19.9% and 17.0% for the years ended December 31, 2015 and 2014. The slight increase was primarily due to increase in recognition of revenue from expired contracts of $0.9 million or 57.4%. We currently operate in other foreign markets, including European, Asian and African countries (including Germany, Hong Kong, India, Ireland, Malaysia, Singapore, South Africa, Sweden and Australia.) This segment of our business is gaining traction and has shown significant growth in revenue in 2015 compared to 2014. Revenue derived from the Rich Dad brands was $0.5 million and $0.8 million or as a percentage of total segment revenue was 9.0% and 23.0% for the years ended December 31, 2015 and 2014. The segment revenue was $6.0 million and $3.6 million or as a percentage of total revenue was 6.9% and 3.6% for the years ended December 31, 2015 and 2014. The increase was due to increased attendance (i.e. fulfillment) of $2.5 million or 68.5%. Revenue was $87.2 million for the year ended December 31, 2015 compared to $96.5 million for the year ended December 31, 2014, a decline of $9.3 million or 9.6%. The decrease was due to the decline in recognition of revenue of $13.9 million or 66.7%, due to the change in our revenue recognition policy with regards to DVD fulfillment partially offset by increased attendance (i.e. fulfillment) of $3.1 million or 4.8% and recognition of revenue from expired contracts of $1.5 million or 12.9%. 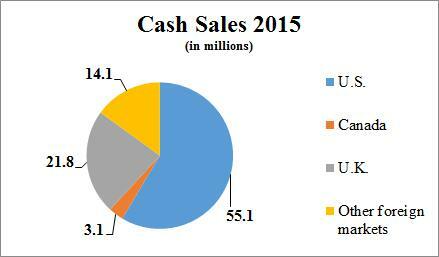 Cash sales were $94.1 million for the year ended December 31, 2015 compared to $81.9 million for the year ended December 31, 2014, an increase of $12.2 million or 14.9%. Total operating costs and expenses were $90.3 million for the year ended December 31, 2015 compared to $90.9 million for the year ended December 31, 2014, a decrease of $0.6 million or 0.7%. The decrease was due to a $1.2 million decrease in advertising and sales expenses, a $0.8 million decrease in royalty expense and a $1.6 million decrease in general and administrative expenses partially offset by a $3.0 million increase in direct course expenses. Direct course expenses relate to our free preview workshops, basic training and elite training, and consist of instructor fees, facility costs, salaries, commissions and fees associated with our field representatives and related travel expenses. Direct course expenses were $48.2 million for the year ended December 31, 2015 compared to $45.2 million for the year ended December 31, 2014, an increase of $3.0 million or 6.6%, which was primarily related to our international expansion initiative. We generally obtain most of our potential customers through internet-based advertising. The trend of increasing online advertising and reducing direct mail and radio advertising continued during the year ended December 31, 2015 compared to the year ended December 31, 2014, as we believe it is a more cost-efficient method of attracting potential customers. Advertising and sales expenses consist of purchased media to generate registrations to our free preview workshops and costs associated with supporting customer recruitment. We obtain the majority of our customers through free preview workshops. These preview workshops are offered in various metropolitan areas in the U.S., the United Kingdom, Canada, and other international markets. Prior to the actual workshop, we spend a significant amount of money in the form of advertising through various media channels. Advertising and sales expenses were $20.3 million for the year ended December 31, 2015 compared to $21.5 million for the year ended December 31, 2014, a decrease of $1.2 million, or 5.6%. The decrease was driven by lower media expenses. We have licensing and related agreements with RDOC, whereby we have exclusive rights to develop, market, and sell Rich Dad-branded live seminars, training courses, and related products worldwide. In connection with these agreements and our other licensing agreements, we are required to pay royalties. Royalty expenses were $5.5 million for the year ended December 31, 2015 compared to $6.3 million for the year ended December 31, 2014, a decrease of $0.8 million, or 12.7%. The decrease was driven mostly by lower licensing costs related to lower revenue period over period. General and administrative expenses primarily consist of compensation, benefits, insurance, professional fees, facilities expense and travel for the corporate staff, as well as depreciation and amortization expenses. General and administrative expenses were $16.3 million for the year ended December 31, 2015 compared to $17.9 million for the year ended December 31, 2014, a decrease of $1.6 million, or 8.9%. The decrease was primarily driven by lower compensation costs. In April 2014, we entered into an agreement with RDOC to settle certain claims we had against RDOC, Robert Kiyosaki, and Darren Weeks. As part of this legal settlement agreement, approximately $1.3 million of debt was cancelled, essentially eliminating all of our remaining long-term debt. Income tax expense was $15.0 thousand and $60.0 thousand for the year ended December 31, 2015 and 2014. Our effective tax rate was (0.6)% and 0.8% for the year ended December 31, 2015 and 2014. Our effective tax rates differed from the U.S. statutory corporate tax rate of 35.0% primarily because of the mix of pre-tax income or loss earned in certain jurisdictions and the change in our valuation allowance. See Note 8 Income Taxes, for further information. We record a valuation allowance when it is more likely than not that some portion, or all, of the deferred tax assets will not be realized. As of December 31, 2015 and December 31, 2014, a valuation allowance of $7.2 million and $7.9 million, have been provided against net operating loss carryforwards and other deferred tax assets. We decreased our valuation allowance by $0.7 million and $4.3 million for the year ended December 31, 2015 and 2014. Net income (loss) was $(2.7) million or $(0.12) per basic and diluted common share for the year ended December 31, 2015, an increase in net loss of $10.1 million compared to net income of $7.4 million or $0.45 per basic common share and $0.42 per diluted common share for the year ended December 31, 2014. Net loss for the year ended December 31, 2015 was negatively impacted by the decline in recognition of revenue of $13.9 million due to the change in our revenue recognition policy with regards to DVD fulfillment. In addition, net income for the year ended December 31, 2014 was positively impacted by $20.9 million, or $1.33 per basic common share and $1.26 per diluted common share, due to the changed in our revenue recognition policy with regards to DVD fulfillment. The preparation of financial statements in accordance with GAAP requires management to make estimates and assumptions that affect reported amounts and related disclosures. In addition to the estimates presented below, there are other items within our consolidated financial statements that require estimation, but are not deemed critical as defined below. We believe these estimates are reasonable and appropriate. However, if actual experience differs from the assumptions and other considerations used, the resulting changes could have a material effect on the financial statements taken as a whole. Management believes that the following policies and estimates are critical because they involve significant judgments, assumptions and estimates. Management has discussed the development and selection of the critical accounting estimates with the Audit Committee of our Board of Directors and the Audit Committee has reviewed the disclosures presented below relating to those policies and estimates. We evaluate the carrying amount of our long-lived assets for impairment whenever events or changes in circumstances indicate that the carrying amount of an asset may not be recoverable. We record an impairment loss when indications of impairment are present and undiscounted cash flows estimated to be generated by those assets are less than assets’ carrying value. We evaluate the remaining life and recoverability of long-lived assets whenever events or changes in circumstances indicate that the carrying amount of these assets may not be recoverable. At such time, we estimate the future cash flows expected from the use of the assets and their eventual dispositions and, if lower than the carrying amounts, adjust the carrying amount of the assets to their estimated fair value. Because of our changing business conditions including current and projected level of income, business trends, prospects and market conditions, our estimates of cash flows to be generated from our operations could change materially, resulting in the need to record additional impairment charges. We recognize revenue in accordance with FASB ASC 605, Revenue Recognition (“ASC 605”). We recognize revenue when: (i) persuasive evidence of an arrangement exists, (ii) delivery of product has occurred or services have been rendered, (iii) the price to the buyer is fixed or determinable, and (iv) collectability is reasonably assured. For product sales, these conditions are generally met upon shipment of the product to the student or completion of the sale transaction. For training and service sales, these conditions are generally met upon presentation of the training seminar or delivery of the service. Some of our training and consulting contracts contain multiple deliverable elements that include training along with other products and services. In accordance with ASC 605-25 , Revenue Recognition – Multiple-Element Arrangements, sales arrangements with multiple deliverables are divided into separate units of accounting if the deliverables in the sales contract meet the following criteria: (i) the delivered training or product has value to the client on a standalone basis, (ii) there is objective and reliable evidence of the contract price of undelivered items and (iii) delivery of any undelivered item is probable. The contract price of each element is generally determined by prices charged when sold separately. In certain arrangements, we offer these products bundled together at a discount. The discount is allocated on a pro-rata basis to each element based on the relative contract price of each element when contract price support exists for each element in the arrangements. The overall contract consideration is allocated among the separate units of accounting based upon their contract prices, with the amount allocated to the delivered item being limited to the amount that is not contingent upon the delivery of additional items or meeting other specified performance conditions. Contract price of the undelivered items is based upon the normal pricing practice for our existing training programs, consulting services, and other products, which are generally the prices of the items when sold separately. In the normal course of business, we recognize revenue based on the customers’ attendance of the course, mentoring training, coaching session or delivery of the software, data or course materials on-line. After a customer contract expires we record breakage revenue less a reserve for cases where we allow a customer to attend after expiration. We recognized revenue at the conclusion of the contract period of approximately $20.2 million and $34.1 million, respectively in 2015 and 2014. Our reserve for course attendance after expiration was $1.3 million and $1.5 million at December 31, 2015 and 2014, respectively. We provide a satisfaction guarantee to our customers. Very few customers exercise this guarantee. Deferred revenue occurs from courses, online courses, mentorships, coaching sessions and website subscriptions and renewals in which payment is received before the service has been performed or if a customer contract expires. Deferred revenue is recognized into revenue as courses are attended in-person or on-line or coaching and mentor sessions are provided. While many of our course package contracts are two years, we consider the fulfillment of them as a current liability because a customer could complete a two year package in one year. We do have a few products that are scheduled to last beyond one year and are accounted for as long-term deferred revenue. 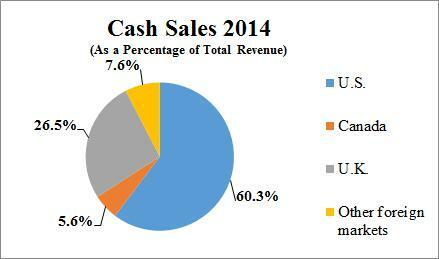 Revenue amounts presented in our consolidated financial statements are shown net of any sales tax. We account for income taxes in conformity with the requirements of ASC 740, Income Taxes (“ASC 740”). Per ASC 740, the provision for income taxes is calculated using the asset and liability approach of accounting for income taxes. We recognize deferred tax assets and liabilities, at enacted income tax rates, based on the temporary differences between the financial reporting basis and the tax basis of our assets and liabilities. We include any effects of changes in income tax rates or tax laws in the provision for income taxes in the period of enactment. When it is more likely than not that a portion or all of a deferred tax asset will not be realized in the future, we provide a corresponding valuation allowance against the deferred tax asset. ACS 740 also clarifies the accounting for uncertainty in income taxes recognized in a company’s financial statements and prescribes a recognition threshold of more likely than not and a measurement process for financial statement recognition and measurement of a tax position taken or expected to be taken in a tax return. In making this assessment, a company must determine whether it is more likely than not that a tax position will sustained upon examination, based solely on the technical merits of the position and must assume that the tax position will be examined by taxing authorities. ACS 740 also provides guidance on derecognition, classification, interest and penalties, accounting in interim periods, disclosures and transition. We are involved in various legal proceedings. Due to their nature, such legal proceedings involve inherent uncertainties including, but not limited to, court rulings, negotiations between affected parties, and the possibility of governmental intervention. Management assesses the probability of loss for such contingencies and accrues a liability and/or discloses the relevant circumstances as appropriate. While certain of these matters involve substantial amounts, management believes, based on available information, that the ultimate resolution of such legal proceedings will not have a material adverse effect on our financial condition or results of operations. The critical accounting policies discussed above are not intended to be a comprehensive list of all of our accounting policies. In many cases, the accounting treatment of a particular transaction is specifically dictated by accounting principles generally accepted in the U.S., with no need for management’s judgment in their application. There are also areas in which management’s judgment in selecting any available alternative would not produce a materially different result. In general, we believe we will experience increased demand for our products and services as global economic conditions continue to slowly improve since the economic recession that began in 2008, including the decline in unemployment and the increased availability of consumer credit, particularly in the U.S. We believe that our products and services appeal to those who seek increased financial freedom. If we experience a prolonged decline in demand for our products and services, it could have a material adverse effect on our future operating results. As part of our April 22, 2014 agreements with RDOC, we reduced the royalty rate applied to our Rich Dad branded revenues for calendar year 2014, which represented a significant savings to us in 2014. In 2015, the rate reverted to the normal royalty rate. We anticipate incurring increased professional fees and expenses associated with our reporting obligations as a public company of approximately $0.8 million annually, including fees and expenses for our annual audit and quarterly reviews, and our initiatives described in “Item 7. Management's Discussion and Analysis-Results of Operations-Recent Developments”. Net cash provided by operating activities was $2.8 million in the year ended December 31, 2015 compared to net cash used in operating activities of $(1.7) million in the year ended December 31, 2014. The $4.5 million increase was primarily the result of a decrease in current liabilities for deferred revenue in 2014 as a result of increased recognition of revenue from expired contracts, due to the change in our revenue recognition policy with regards to DVD fulfillment. Net cash used in investing activities totaled $81.0 thousand in the year ended December 31, 2015 and $187.0 thousand in the year ended December 31, 2014, representing our purchases of property and equipment. Our consolidated capital structure as of December 31, 2015 and December 31, 2014 was 100.0% equity. Net cash provided by financing activities totaled $0.5 million in the year ended December 31, 2015 compared to net cash used in financing activities of $0.3 million in the year ended December 31, 2014, representing a period-over-period increase in cash from financing activities of $0.8 million. We expect that our working capital deficit, which is primarily a result of our significant deferred revenue balance, will continue for the foreseeable future. As of December 31, 2015 and 2014, our consolidated current deferred revenue was $60.7 million and $56.1 million, respectively. Our cash equivalents were, and continue to be, invested in short-term, liquid, money market funds. Restricted cash balances consisted primarily of funds on deposit with credit card processors and cash collateral with our credit card vendors. Restricted cash balances held by credit card processors are unavailable to us unless we discontinue sale of our products or discontinue the usage of a vendor’s credit card. As sales of the products and services related to our domestic business have decreased, our credit card vendors have not returned funds held as collateral, resulting in slightly higher restricted cash balances. We are not a party to any material off-balance sheet arrangements as of December 31, 2015. We have audited the accompanying consolidated balance sheets of Legacy Education Alliance, Inc. and its subsidiaries (collectively, the “Company”) as of December 31, 2015 and 2014 and the related consolidated statements of operations and comprehensive income (loss), changes in stockholders’ deficit, and cash flows for the years then ended. These financial statements are the responsibility of the Company’s management. Our responsibility is to express an opinion on these financial statements based on our audits. We conducted our audits in accordance with standards of the Public Company Accounting Oversight Board (United States). Those standards require that we plan and perform the audit to obtain reasonable assurance about whether the financial statements are free of material misstatements. The Company is not required to have, nor were we engaged to perform, an audit of its internal control over financial reporting. Our audits included consideration of internal control over financial reporting as a basis for designing audit procedures that are appropriate in the circumstances, but not for the purpose of expressing an opinion on the effectiveness of the Company’s internal control over financial reporting. Accordingly, we express no such opinion. An audit includes examining, on a test basis, evidence supporting the amounts and disclosures in the financial statements. An audit also includes assessing the accounting principles used and significant estimates made by management, as well as evaluating the overall financial statement presentation. We believe that our audits provide a reasonable basis for our opinion. In our opinion, the financial statements referred to above present fairly, in all material respects, the financial position of Legacy Education Alliance, Inc. and its subsidiaries as of December 31, 2015 and 2014 and the results of their operations and their cash flows for the years then ended, in conformity with accounting principles generally accepted in the United States of America. Reverse Merger and Recapitalization. On November 10, 2014, we entered into an Agreement and Plan of Merger dated as of such date the (“Merger Agreement”) by and among (i) Priced In Corp., a Nevada corporation (“PRCD”), (ii) Priced In Corp. Subsidiary, a Colorado corporation and a wholly-owned subsidiary of PRCD (“PRCD Sub”), (iii) Tigrent Inc., a Colorado corporation (“TIGE”), and (iv) Legacy Education Alliance Holdings, Inc., a Colorado corporation and a wholly-owned subsidiary of TIGE (“Legacy Holdings”). On November 10, 2014, pursuant to the Merger Agreement, PRCD Sub merged with and into Legacy Holdings (the “Merger”), with Legacy Holdings surviving the Merger and becoming our wholly owned subsidiary and we acquired the business of Legacy Holdings. There was no cash consideration exchanged in the Merger. In accordance with the terms and conditions of the Merger Agreement, PRCD agreed to pay TIGE taxes and related liabilities and other specified costs and expenses, including certain administrative and related expenses that have been or will be from time to time incurred by TIGE that are related to TIGE’s investment in PRCD (including the cost of preparing and distributing reports regarding our business and financial condition to its shareholders), its administrative costs and expenses, and taxes, other than income taxes arising from dividends or distributions by us to TIGE. All shares of PRCD common stock issued in connection with the Merger are restricted securities, as defined in paragraph (a) of Rule 144 under the Securities Act of 1933, as amended (the “Securities Act”). Such shares were issued pursuant to an exemption from the registration requirements of the Securities Act, under Section 4(a)(2) of the Securities Act and the rules and regulations promulgated thereunder. The Merger was accounted for as a “reverse merger” and recapitalization since, immediately following the completion of the transaction, the holders of TIGE’s stock had effective control of PRCD. In addition, Tigrent Inc. controls the surviving entity through control of Legacy’s Board of Directors as a result of the appointment of the existing directors of Tigrent to the four board seats of Legacy. Additionally, all of TIGE’s officers and senior executive positions continued on as management of the surviving entity after consummation of the Merger. For accounting purposes, Legacy Holdings was deemed to be the accounting acquirer in the transaction and, consequently, the transaction was treated as a recapitalization of PRCD. Accordingly, Legacy Holdings’ assets, liabilities and results of operations became the historical financial statements of the registrant, and the Company’s assets, liabilities and results of operations were consolidated with PRCD effective as of the date of the closing of the Merger. Prior to the Merger, PRCD was a “shell” corporation with nominal assets, liabilities and operating activity. No step-up in basis or intangible assets or goodwill was recorded in this transaction. See Note 10 Capital Stock and Recapitalization, for further disclosures regarding our recapitalization effects on our consolidated financial statements. Basis of Presentation. The terms “Legacy Education Alliance, Inc.,” the “Company,” “we,” “our,” “us” or "Legacy" as used in this report refer collectively to Legacy Education Alliance, Inc., a Nevada corporation (“Legacy”), the registrant, which was formerly known as Priced In Corp., and, unless the context otherwise requires, together with its wholly-owned subsidiary, Legacy Education Alliance Holdings, Inc., a Colorado corporation, other operating subsidiaries and any predecessor of Legacy Education Alliance Holdings, including Tigrent Inc., a Colorado corporation. All intercompany balances and transactions have been eliminated in consolidation. Reclassifications. Certain amounts reported in the consolidated financial statements for the prior periods have been reclassified to conform to the current reporting presentation. Use of estimates. The preparation of consolidated financial statements in conformity with accounting principles generally accepted in the United States of America requires management to make estimates and assumptions that affect the reported amounts of assets and liabilities and disclosure of contingent assets and liabilities at the date of the consolidated financial statements and the reported amounts of revenues and expenses during the reporting period. Actual results could differ from those estimates. Cash and cash equivalents. We consider all highly liquid instruments with an original maturity of three months or less to be cash or cash equivalents. We continually monitor and evaluate our investment positions and the creditworthiness of the financial institutions with which we invest and maintain deposit accounts. When appropriate, we utilize Certificate of Deposit Account Registry Service (CDARS) to reduce banking risk for a portion of our cash in the United States. A CDAR consists of numerous individual investments, all below the FDIC limits, thus fully insuring that portion of our cash. At December 31, 2015 and 2014, we did not have a CDAR balance. Restricted cash. Restricted cash balances consist primarily of funds on deposit with credit card and other payment processors and cash collateral with our purchasing card provider. These balances do not have the benefit of federal deposit insurance and are subject to the financial risk of the parties holding these funds. Restricted cash balances held by credit card processors are unavailable to us unless, and for a period of time after, we discontinue the use of their services. The hold back percentages are generally five percent of the monthly credit card charges that are held for six months. The cash collateral held by our charge card provider is unavailable unless we discontinue the usage of the purchasing card. Because a portion of these funds can be accessed and converted to unrestricted cash in less than one year in certain circumstances, that portion is considered a current asset. Financial Instruments. Financial instruments consist primarily of cash and cash equivalents, notes receivable, accounts payable, deferred course expenses, accrued expenses, deferred revenue, and debt. GAAP requires the disclosure of the fair value of financial instruments, including assets and liabilities recognized in the balance sheets. Our only financial liabilities measured and recorded at fair value on our consolidated balance sheets on a recurring basis are the derivative financial instruments. Management believes the carrying value of the other financial instruments recognized on the consolidated balance sheets (including receivables, payables and accrued liabilities) approximate their fair value. Inventory. Inventory consists primarily of books, videos and training materials held for sale to students enrolled in our training programs. Inventory is stated at the lower of cost or market using the first-in, first-out method. Deposits with credit card processors. The deposits with our credit card processors are held due to arrangements under which our credit card processors withhold credit card funds to cover charge backs in the event we are unable to honor our commitments. The deposits are six months or less rolling reserves. Leasehold improvements are amortized over the shorter of the estimated useful asset life or the remaining term of the applicable lease. In accordance with GAAP, we evaluate the carrying amount of our long-lived assets such as property and equipment, and finite-lived intangible assets subject to amortization for impairment whenever events or changes in circumstances indicate that the carrying amount of an asset may not be recoverable. Recoverability of assets held and used is measured by the comparison of its carrying amount with the future net cash flows the asset is expected to generate. We look primarily to the undiscounted future cash flows in the assessment of whether or not long-lived assets have been impaired. If the carrying amount of an asset exceeds its estimated undiscounted future cash flows, an impairment charge is recognized for the amount by which the carrying amount of the asset exceeds the estimated fair value of the asset. Revenue recognition. We recognize revenue in accordance with FASB ASC 605, Revenue Recognition (“ASC 605”). We recognize revenue when: (i) persuasive evidence of an arrangement exists, (ii) delivery of product has occurred or services have been rendered, (iii) the price to the buyer is fixed or determinable, and (iv) collectability is reasonably assured. For product sales, these conditions are generally met upon shipment of the product to the student or completion of the sale transaction. For training and service sales, these conditions are generally met upon presentation of the training seminar or delivery of the service. Some of our training and consulting contracts contain multiple deliverable elements that include training along with other products and services. In accordance with ASC 605-25, Revenue Recognition – Multiple-Element Arrangements , sales arrangements with multiple deliverables are divided into separate units of accounting if the deliverables in the sales contract meet the following criteria: (i) the delivered training or product has value to the client on a standalone basis, (ii) there is objective and reliable evidence of the contract price of undelivered items and (iii) delivery of any undelivered item is probable. The contract price of each element is generally determined by prices charged when sold separately. In certain arrangements, we offer these products bundled together at a discount. The discount is allocated on a pro-rata basis to each element based on the relative contract price of each element when contract price support exists for each element in the arrangements. The overall contract consideration is allocated among the separate units of accounting based upon their contract prices, with the amount allocated to the delivered item being limited to the amount that is not contingent upon the delivery of additional items or meeting other specified performance conditions. Contract price of the undelivered items is based upon the normal pricing practice for our existing training programs, consulting services, and other products, which are generally the prices of the items when sold separately. Revenue amounts in our consolidated financial statements are shown net of any sales tax. Deferred course expenses. We defer licensing fees and commissions and fees paid to our speakers and telemarketers until such time as the revenue is earned. Our speakers, who are all independent contractors, earn commissions on the cash receipts received at our training events and are paid approximately 45 days after the training event. The deferred course expenses are expensed as the corresponding deferred revenue is recognized. We also capitalize the commissions and fees paid to our speakers and expense them as the corresponding deferred revenue is recognized. Advertising expenses. We expense advertising as incurred. Advertising paid in advance is recorded as a prepaid expense until such time as the advertisement is published. We incurred approximately $16.5 million and $18.7 million in advertising expense for the years ended December 31, 2015 and 2014, respectively, which is included in advertising and sales expenses in the accompanying Consolidated Statements of Operations and Comprehensive Income (Loss). Included in prepaid expenses and other current assets is approximately $0.2 million and $0.3 million of prepaid media costs as of December 31, 2015 and 2014, respectively. Income taxes. We account for income taxes in conformity with the requirements of ASC 740, Income Taxes (“ASC 740”). Per ASC 740, the provision for income taxes is calculated using the asset and liability approach of accounting for income taxes. We recognize deferred tax assets and liabilities, at enacted income tax rates, based on the temporary differences between the financial reporting basis and the tax basis of our assets and liabilities. We include any effects of changes in income tax rates or tax laws in the provision for income taxes in the period of enactment. When it is more likely than not that a portion or all of a deferred tax asset will not be realized in the future, we provide a corresponding valuation allowance against the deferred tax asset. ASC 740 also clarifies the accounting for uncertainty in income taxes recognized in a company’s financial statements and prescribes a recognition threshold of more likely than not and a measurement process for financial statement recognition and measurement of a tax position taken or expected to be taken in a tax return. In making this assessment, a company must determine whether it is more likely than not that a tax position will be sustained upon examination, based solely on the technical merits of the position and must assume that the tax position will be examined by taxing authorities. ASC 740 also provides guidance on derecognition, classification, interest and penalties, disclosures and transition. Foreign currency translation. We account for foreign currency translation in accordance with ASC 830, Foreign Currency Translation. The functional currencies of the Company’s foreign operations are the reported local currencies. Translation adjustments result from translating our foreign subsidiaries’ financial statements into United States dollars. The balance sheet accounts of our foreign subsidiaries are translated into United States dollars using the exchange rate in effect at the balance sheet date. Revenue and expenses are translated using average exchange rates for each month during the fiscal year. The resulting translation gains or losses are recorded as a component of accumulated other comprehensive income (loss) in stockholders’ deficit. Business is generally transacted in a single currency not requiring meaningful currency transaction costs. We do not practice hedging as the risks do not warrant the costs. Share-based compensation. We account for share-based awards under the provisions of ASC 718, “Compensation—Stock Compensation.” Accordingly, share-based compensation cost is measured at the grant date based on the fair value of the award and we expense these costs using the straight-line method over the requisite service period. Share-based compensation expense was $63 thousand and $22 thousand for the years ended December 31, 2015 and 2014, respectively. See Note 6 - Share-Based Compensation, for additional disclosures regarding our share-based compensation. Comprehensive income (loss). Comprehensive income (loss) includes changes to equity accounts that were not the result of transactions with stockholders. Comprehensive income (loss) is comprised of net income (loss) and other comprehensive income (loss) items. Our comprehensive income (loss) generally consists of changes in the cumulative foreign currency translation adjustment. Recent Accounting Pronouncements. We have implemented all new accounting pronouncements that are in effect and that management believes would materially impact our financial statements. In February 2016, the Financial Accounting Standards Board (“FASB”) issued Accounting Standards Update (“ASU”) No 2016-02 “Leases” (Topic 842). The standard requires companies that lease valuable assets like aircraft, real estate, and heavy equipment to recognize on their balance sheets the assets and liabilities generated by contracts longer than a year. The standard also requires companies to disclose in the footnotes to their financial statements information about the amount, timing, and uncertainty for the payments they make for the lease agreements. This standard is effective for fiscal years and interim periods beginning after December 15, 2018. Early adoption is permitted. We expect to adopt this standard when effective, and the impact on our financial statements is not currently estimable. In January 2016, the FASB issued ASU No 2016-01, “Recognition and Measurement of Financial Assets and Financial Liabilities”, Financial Instruments – Overall (Subtopic 825-10). The new guidance is intended to improve the recognition and measurement of financial instruments. This guidance requires that financial assets and financial liabilities must be separately presented by measurement category and form of financial asset on the balance sheet or the accompanying notes to the financial statements. This guidance is effective for fiscal years and interim periods beginning after December 15, 2017. The standard includes a requirement that businesses must report changes in the fair value of their own liabilities in other comprehensive income instead of earnings, and this is the only provision of the update for which the FASB is permitting early adoption. We expect to adopt this guidance when effective, and do not expect this guidance to have a significant impact on our financial statements. In November 2015, the FASB issued ASU No 2015-17, “Balance Sheet Classification of Deferred Taxes”, Income Taxes (Topic 740), to simplify the balance sheet classification of deferred taxes. This guidance requires that all deferred tax liabilities and assets should be classified as noncurrent on the balance sheet. This guidance is effective for fiscal years and interim periods beginning after December 15, 2016. The companies may choose to use either retrospective or prospective application. Early adoption is permitted. We expect to adopt this guidance when effective, and do not expect this guidance to have a significant impact on our financial statements. In September 2015, the FASB issued ASU No 2015-16, “Simplifying the Accounting for Measurement-Period Adjustments”, Business Combinations (Topic 805), to simplify the accounting for adjustments made during the measurement period to provisional amounts recognized in a business combination. This guidance requires that an acquirer recognize adjustments to provisional amounts that are identified during the measurement period in the period in which the adjustment amount is determined. The acquirer is required to also record, in the same period’s financial statements, the effect on earnings of changes in depreciation, amortization, or other income effects, if any, as a result of the change to the provisional amounts, calculated as if the accounting had been completed at the acquisition date. In addition the acquirer is required to present separately on the face of the income statement or disclose in the notes to the financial statements the portion of the amount recorded in current-period earnings by line item that would have been recorded in previous reporting periods if the adjustment to the provisional amounts had been recognized as of the acquisition date. This guidance is effective for fiscal years and interim periods beginning after December 15, 2015, and requires prospective application. Early adoption is permitted. We expect to adopt this guidance when effective, and do not expect this guidance to have a significant impact on our financial statements. In July 2015, the FASB issued ASU No 2015-11, “Simplifying the Measurement of Inventory”, Inventory (Topic 330) to simplify the measurement of inventory measured using the first-in, first-out (“FIFO”) or average cost method. This guidance requires entities to measure inventory at the lower of cost and net realizable value. Net realizable value is the estimated selling prices in the ordinary course of business, less reasonably predictable costs of completion, disposal, and transportation. This guidance is effective for fiscal years and interim periods beginning after December 15, 2016 with prospective application. Early adoption is permitted when applying the amendments and switching to the new accounting at the beginning of the reporting period in which the amendments are adopted. We expect to adopt this guidance when effective, and do not expect this guidance to have a significant impact on our financial statements. In January 2015, the FASB issued ASU No. 2015-01, “Income Statement – Extraordinary and Unusual Items (Subtopic 225-20) ” (“ASU 2015-01”). The amendment eliminates the concept of extraordinary items. If an event meets the criteria for extraordinary classification, an entity is required to segregate the item from the results of ordinary operations and show the item separately in the income statement, net of tax. ASU 2015-01 is effective for fiscal years beginning after December 15, 2015, and early adoption is permitted. Accordingly, the standard is effective for us on January 1, 2016. We do not expect that the standard will have a material effect on our financial statement presentation going forward. In August 2014, the FASB issued ASU No. 2014-15, “Presentation of Financial Statements-Going Concern (Topic 205-40) ” (“ASU 2014-15”). Under the standard, management is required to evaluate for each annual and interim reporting period whether it is a probable that the entity will not be able to meet its obligations as they become due within one year after the date that financial statements are issued, or are available to be issued, where applicable. ASU 2014-15 is effective for fiscal years, and interim periods within those years, beginning after December 15, 2016, and early adoption is permitted. Accordingly, the standard is effective for us on January 1, 2017. We will be evaluating the impact, if any, that the standard will have on our financial condition, results of operations, and disclosures in the near future. In May 2014, the FASB issued ASU No. 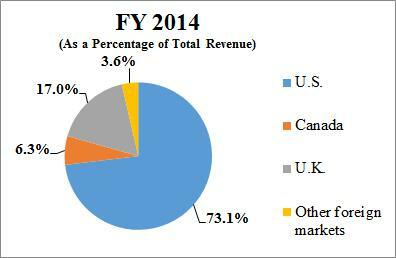 2014-09, “Revenue from Contracts with Customers (Topic 606) ” (“ASU 2014-09”). The standard is a comprehensive new revenue recognition model that requires revenue to be recognized in a manner to depict the transfer of goods or services to a customer at an amount that reflects the consideration expected to be received in exchange for those goods or services. ASU 2014-09 is effective for fiscal years, and interim periods within those years, beginning after December 15, 2016, and early adoption is not permitted. Accordingly, the standard is effective for us on January 1, 2017. We will be evaluating the impact, if any, that the standard will have on our financial condition, results of operations, and disclosures in the near future. In April 2014, the FASB issued ASU No. 2014-08, “Presentation of Financial Statements (Topic 205) and Property, Plant, and Equipment (Topic 360), Reporting Discontinued Operations and Disclosures of Disposals of Components of an Entity” (“ASU 2014-08”) that changes the requirements for reporting discontinued operations in Subtopic 205-20. A discontinued operation may include a component of an entity or a group of components of an entity, or a business or nonprofit activity. A disposal of a component of an entity or a group of components of an entity is required to be reported in discontinued operations if the disposal represents a strategic shift that has (or will have) a major effect on an entity’s operations and financial results. ASU 2014-08 is effective for fiscal years, and interim periods within those years, beginning after December 15, 2014. Early adoption is permitted, but only for disposals (or classifications as held for sale) that have not been reported in financial statements previously issued or available for issuance. Accordingly, the standard is effective for us on January 1, 2015. We do not expect that the standard will have a material impact on our financial condition, results of operations, and disclosures when adopted. We maintain deposits in banks which may exceed the federal deposit insurance available. 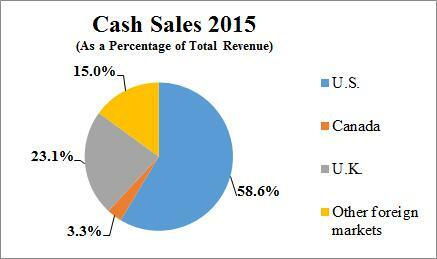 Management believes the potential risk of loss on these cash and cash equivalents to be minimal. All cash balances as of December 31, 2015 and 2014, including foreign subsidiaries, without FDIC coverage was $3.8 million and $2.3 million, respectively. A significant portion of our revenue is derived from the Rich Dad brands. For the years ended December 31, 2015 and 2014, Rich Dad brands provided 77% and 87% of our revenue, respectively. In addition, we have operations in the U.S., Canada, the United Kingdom and Other foreign markets (see Note 14— Segment Information). Depreciation expense on property and equipment in each of the years ended December 31, 2015 and 2014 was approximately $0.2 million. The Company has one 2015 Equity Plan, the 2015 Incentive Plan, Tigrent Inc., has two incentive stock plans; the 2009 Incentive Plan and the 2012 Incentive Plan, which cover some of our current employees and directors. The financial activity pertaining to our employees and directors under the 2009 Incentive Plan, the 2012 Incentive Plan and the 2015 Incentive Plan (collectively, the “Incentive Plans”) is reflected in our consolidated financial statements, presented herein, and therefore, we are providing our historical disclosures pertaining to those plans. All references to share quantities and values in the ensuing descriptions reflect historical information from Tigrent Inc. and have not been adjusted for the impact of the Merger. The 2015 Incentive Plan was approved by the stockholders at our annual meeting of stockholders on July 16, 2015. The 2015 Incentive Plan reserves 5,000,000 shares of our Common Stock for stock options, restricted stock, and a variety of other types of equity awards. We believe that long-term incentive compensation programs align the interests of management, employees and the stockholders to create long-term stockholder value. We believe that equity based incentive compensation plans, such as the Incentive Plan, increase our ability to achieve this objective, and, by allowing for several different forms of long-term equity based incentive awards, help us to recruit, reward, motivate and retain talented employees and other service providers. The text of the 2015 Incentive Plan is included in the attachment marked as Appendix B to the Company’s Proxy Statement on Schedule 14A filed with the Securities and Exchange Commission on June 16, 2015. During the year ended December 31, 2015 pursuant to the 2015 Incentive Plan we awarded 714,019 shares of restricted stock to our employees, which are subject to a three-year cliff vesting and 208,967 shares of restricted stock to members of the board of directors, which are subject to a two-year cliff vesting. The 2009 Incentive Plan, which was approved by Tigrent stockholders on September 2, 2009, provides for the issuance of up to 1.3 million shares of Tigrent’s common stock. The 2009 Incentive Plan allows for the granting of a broad range of award types, including stock options (incentive and non-qualified), stock appreciation rights, restricted stock, restricted stock units, performance shares and performance units and other stock awards. Employees, directors, officers and consultants are eligible to receive awards. The purpose of the 2009 Incentive Plan is to motivate participants to achieve long range goals, attract and retain eligible employees, provide incentives competitive with other similarly situated companies and align the interest of employees and directors with those of our stockholders. The 2009 Incentive Plan is administered by the Compensation Committee of the Board of Directors. As of December 31, 2015, an aggregate of 165,000 shares remain available for further grants under this plan. The 2012 Incentive Plan, which was approved by Tigrent stockholders on May 23, 2012, provides for the issuance of up to 750,000 shares of our common stock. This incentive plan supplements the 2009 Incentive Plan. The 2012 Incentive Plan allows for the granting of a broad range of award types, including stock options (incentive and non-qualified), stock appreciation rights, restricted stock, restricted stock units, performance shares and performance units and other stock awards. Employees, directors, officers and consultants are eligible to receive awards. The purpose of the 2012 Incentive Plan is to motivate participants to achieve long range goals, attract and retain eligible employees, provide incentives competitive with other similarly situated companies and align the interest of employees and directors with those of our stockholders. The Incentive Plan is administered by the Compensation Committee of the Board of Directors. On April 30, 2013 the Compensation Committee granted restricted performance stock award grants for an aggregate of 200,000 shares of common stock to an officer pursuant to the 2012 Incentive Plan. The actual restricted shares that vest could be up to 300,000 shares if this officer exceeds performance criteria (as defined). If targets are met, the award vests 50,000 shares per year based on performance through 2017 or fully upon a “change of control” as defined in the Incentive Plan. In 2014, the first tranche of 50,000 restricted shares did not vest as the performance targets were not met. As of December 31, 2015, an aggregate of 480,000 shares remain available for further grants under the 2012 Incentive Plan. In accordance with ASC 718, we record compensation expense for all stock based payment awards made to employees and directors under Tigrent’s Incentive Plans based on the market value of its common stock on the date of issuance. The value of the portion of the awards that is ultimately expected to vest is recognized as an expense over the requisite service periods on a straight-line basis. Unrecognized compensation expense associated with unvested share-based payment awards, consisting entirely of unvested restricted stock, was approximately $350,000 and $61,000 at December 31, 2015 and 2014, respectively. That cost is expected to be recognized over a weighted-average period of 2.4 years. Our stock-based compensation expense was less than $0.1 million for each of the two years ended December 31, 2015 and 2014, and is included in general and administrative expenses in the accompanying Consolidated Statements of Operations and Comprehensive Income (Loss). There were no related income tax effects in either year. We have a 401(k) employee savings plan for eligible employees that provide for a matching contribution from us, determined each year at our discretion. The Company did not match, and therefore incurred no expense, during 2015 and 2014. We recognize deferred tax assets and liabilities, at enacted income tax rates, based on the temporary differences between the financial reporting basis and the tax basis of our assets and liabilities. We include any effects of changes in income tax rates or tax laws in the provision for income taxes in the period of enactment. When it is more likely than not that a portion or all of a deferred tax asset will not be realized in the future, we provide a corresponding valuation allowance against the deferred tax asset. In 2015 and 2014, we recorded a full valuation allowance against all net deferred tax assets because there was not sufficient evidence to conclude that we would more likely than not realize those assets prior to expiration. As of December 31, 2015 and 2014, we had approximately $3.9 million and $3.6 million of federal net operating loss carryforwards, approximately $25.1 million and $21.7 million of foreign net operating loss carryforwards and approximately $10.2 million and $9.3 million of state net operating loss carryforwards, respectively. The federal loss carryforwards will begin to expire in 2032, the foreign loss carryforwards begin to expire in 2027 and the state net operating loss carryforwards begin to expire in 2024. As a result of the Merger discussed in Note 1, and the subsequent issuance of 3,000 shares of Legacy Education Alliance, Inc. common stock, as of December 31, 2014, Tigrent Inc. owned slightly less than 80% of the Company. Tigrent Inc. is, therefore, no longer considered part of the affiliated group as defined in IRC §1504 and can no longer be included in the Company’s consolidated income tax returns filed for subsequent tax years. At December 31, 2014, the tax attributes of Tigrent Inc., including its attributable portion of the consolidated net operating loss carryovers determined pursuant to Reg. §1.1502-21, were separate attributes realizable only by Tigrent Inc. The value of these tax attributes and the corresponding valuation allowance were approximately $1.3 million. During the year ended December 31, 2015, we decreased the valuation allowance by $672 thousand. Deferred tax expense related to the foreign currency translation adjustment for the both years ended December 31, 2015 and 2014 was $0.4 million, and was fully offset by a corresponding decrease in the valuation allowance. These amounts, which net to zero, are reported in other comprehensive income (loss). The deferred tax assets presented above for net operating losses and credits have been reduced by liabilities for unrecognized tax benefits. The Company does not expect to repatriate earnings from its foreign subsidiaries because the cumulative earnings and profits of the foreign subsidiaries as of December 31, 2015 and 2014 are negative. Accordingly, no U.S. federal or state income taxes have been provided thereon. The liability pertaining to uncertain tax positions was $1.7 million at December 31, 2015 and 2014. In accordance with GAAP, we recorded expense that increased the total liability pertaining to uncertain tax positions which was more than offset by a decrease in the total liability attributable to foreign currency fluctuations and tax rate adjustments. A significant portion of the liability pertaining to uncertain tax positions is recorded as a reduction of the value of net operating loss carryovers. We include interest and penalties in the liability for uncertain tax positions. Accrued interest and penalties on uncertain tax positions were approximately $0.1 million at December 31, 2015 and 2014, respectively and is included in other liabilities in the accompanying Consolidated Balance Sheets. There was no penalty and interest expense accrued related to uncertain tax positions for the years ended December 31, 2015 and 2014. If applicable, we recognize interest and penalties related to uncertain tax positions as tax expense. We do not expect any significant changes to unrecognized tax benefits in the next year. At December 31, 2015 and 2014, the Company estimated $0.1 million, of the unrecognized tax benefits, if recognized, would impact the effective tax rate. A substantial portion of our liability for uncertain tax benefits is recorded as a reduction of net operating losses and tax credit carryforwards. During 2015, the Canadian Revenue Agency concluded their audit of the Rich Dad Education Ltd. corporate income tax returns for the years ended December 31, 2010 and 2011. The audit did not result in any changes and the accruals included in our consolidated financial statements are adequate. Our federal income tax returns have been examined and reported upon by the Internal Revenue Service through December 31, 2012, and the years subsequent to 2012 are subject to examination. Our state tax returns for years ranging from 2010 and 2011 are still open and subject to examination. In addition, our Canadian tax returns and United Kingdom tax returns for all years after 2011 are subject to examination. See Note 15— Commitments and Contingencies for additional discussion. As discussed in Note 1— Business Description and Basis of Presentation, effective November 10, 2014, PRCD, formerly an inactive public company, was acquired by a wholly-owned subsidiary of Tigrent Inc., and changed its name to Legacy Education Alliance, Inc. (the “Company”). In conjunction with the Merger, the Company was recapitalized, resulting in a capital structure outlined below. The historical numbers of common shares presented in our consolidated financial statements were converted to equivalent shares post- Merger, at a rate of approximately 1.07 to 1.00. In connection with the Merger accounting, approximately $7.8 million was reclassified from Common Stock to Additional paid-in capital. Our authorized share capital consists of 200,000,000 shares of Common Stock, par value $0.0001 per share, and 20,000,000 shares of preferred stock, par value $0.0001 per share. As of December 31, 2015, 21,845,927 shares of our Common Stock were outstanding. The outstanding shares of our Common Stock are validly issued, fully paid and non-assessable. Holders of Common Stock are entitled to one vote for each share on all matters submitted to a stockholder vote. Holders of Common Stock do not have cumulative voting rights. Therefore, holders of a majority of the shares of Common Stock voting for the election of directors can elect all of the directors. Holders of Common Stock representing a majority of the voting power of the Company’s capital stock issued, outstanding and entitled to vote, represented in person or by proxy, are necessary to constitute a quorum at any meeting of stockholders. A vote by the holders of a majority of the Company’s outstanding shares is required to effectuate certain fundamental corporate changes such as liquidation, merger or an amendment to the Company’s certificate of incorporation. Holders of our Common Stock are entitled to share in all dividends that our Board of Directors, in its discretion, declares from legally available funds. In the event of a liquidation, dissolution or winding up, each outstanding share entitles its holder to participate pro rata in all assets that remain after payment of liabilities and after providing for each class of stock, if any, having preference over the Common Stock. The Common Stock has no pre-emptive, subscription or conversion rights and there are no redemption provisions applicable to the Common Stock. As of December 31, 2015, no shares of our preferred stock were outstanding. Our authorized preferred stock is “blank check” preferred. Accordingly, subject to limitations prescribed by law, our Board is expressly authorized, at its discretion, to adopt resolutions to issue shares of preferred stock of any class or series, to fix the number of shares of any class or series of preferred stock and to change the number of shares constituting any series and to provide for or change the voting powers, designations, preferences and relative, participating, optional or other special rights, qualifications, limitations or restrictions thereof, including dividend rights (including whether the dividends are cumulative), dividend rates, terms of redemption (including sinking fund provisions), redemption prices, conversion rights and liquidation preferences of the shares constituting any series of the preferred stock, in each case without any further action or vote by our stockholders. We paid placement agent cash fees of 13% or $68,785 of the aggregate proceeds that was received and will pay 5% of all amounts received upon the exercise of the Warrants. We also issued to the placement agent warrants to purchase shares of Common Stock equal to 10% of the total shares sold in the offering, or 95,992 shares, at an initial exercise price of $0.75 per share. The value of the warrants was $14,866. We had previously received $459,173 in net cash proceeds related to this private offering, which was recorded in restricted cash and other accrued expenses on our Condensed Consolidated Balance Sheets in the first quarter of 2015. The $459,173 in net cash proceeds is now recorded in Cash and cash equivalents and the placement agent fees and the fair value of the warrants was offset against the proceeds in Additional paid-in capital on our Consolidated Balance Sheets. In connection with this private offering, our placement agent agreement with the placement agent was terminated. Unvested awards of share-based payments with rights to receive dividends or dividend equivalents, such as our restricted stock awards, are considered to be participating securities, and therefore, the two-class method is used for purposes of calculating EPS. Under the two-class method, a portion of net income is allocated to these participating securities and is excluded from the calculation of EPS allocated to common stock. Our restricted stock awards are subject to forfeiture and restrictions on transfer until vested and have identical voting, income and distribution rights to the unrestricted common shares outstanding. Our weighted average unvested restricted stock awards outstanding were 1,129,478 and 854,167 for the years ended December 31, 2015 and 2014, respectively. ● Level 3—Inputs that are unobservable and reflect our assumptions used in pricing the asset or liability based on the best information available under the circumstances (e.g., internally derived assumptions surrounding the timing and amount of expected cash flows). In June 2015, we granted warrants to purchase 959,924 units of the Company’s common stock through a private offering of units (“Units”) in conjunction with an equity raise. Each Unit included one share of Common Stock, par value $0.0001 per share, and a three-year Warrant to purchase one share of Common Stock at an initial exercise price per share equal to $0.75, subject to adjustment for certain corporate transactions such as a merger, stock-split or stock dividend and, if the Company does not continue to be a reporting company under the Securities Exchange Act of 1934 during the two-year period after closing, the exercise price will be reduced to $0.01 per share. Each Unit includes limited registration rights for the investors for the shares of Common Stock and the shares of Common Stock that would be issued upon the exercise of a Warrant ("Underlying Shares") when and if we register our shares of Common Stock in a different offering, subject to certain excluded registered offerings. The Company has also issued to the placement agent warrants to purchase our shares of Common Stock equal to 10% of the total shares sold in the offering, or 95,992 shares. As of December 31, 2015, the fair value of the total warrants' derivative liability is $27,266, and recorded in Other accrued expenses in the Consolidated Balance Sheets. We recognized a gain on the derivative liability of $136,266 for the year ended December 31, 2015, which is recorded in Other income, net in the Consolidated Statements of Operations and Comprehensive Income (Loss). For the years ended December 31, 2015 and 2014, our long-lived assets in the U.S. were approximately $1.2 million and $1.3 million, respectively. For the years ended December 31, 2015 and 2014, our international long-lived assets were less than $0.1 million in each period. Licensing agreements. On April 22, 2014, we entered into an agreement with RDOC to settle certain claims we had against RDOC, Robert Kiyosaki, and Darren Weeks arising out of RDOC’s, Kiyosaki’s, and Weeks’s promotion of a series of live seminars and related products known as Rich Dad:GEO that we alleged infringed on our exclusive rights under the 2013 License Agreement between the Company and RDOC (the “GEO Settlement Agreement”). In the GEO Settlement Agreement, RDOC, Kiyosaki, and Weeks agreed to terminate any further activity in furtherance of the Rich Dad:GEO program. In addition, RDOC agreed, among other things, to (i) amend the 2013 License Agreement to halve the royalty payable by us to RDOC to 2.5% for the whole of 2014, (ii) cancelled approximately $1.3 million in debt owed by us to RDOC, and (iii) reimburse us for the legal fees we incurred in the matter. In addition, RDOC’s right to appoint one member of our Board of Directors previously continued under the 2013 License Agreement was cancelled. We are committed to pay royalties for the usage of certain brands, as governed by various licensing agreements, including Rich Dad, Robbie Fowler and Martin Roberts. Total royalty expenses included in our Consolidated Statement of Operations and Comprehensive Income (Loss) for the years ended December 31, 2015 and 2014 were $5.4 million and $6.3 million, respectively. Operating leases. We lease office space for administrative and training requirements. These leases expire through February 2019 and some of them have renewal options and purchase options. In addition, certain office space leases provide for rent adjustment increases. The accompanying Consolidated Statements of Operations and Comprehensive Income (Loss) reflect rent expense on a straight-line basis over the term of the lease. Rent expense for the years ended December 31, 2015 and 2014 was approximately $1.0 million and $0.8 million, respectively. Except for a condominium lease with our Chief Executive Officer, there are no other related party leases. Custodial and Counterparty Risk. The Company is subject to custodial and other potential forms of counterparty risk in respect of a variety of contractual and operational matters. In the course of ongoing company-wide risk assessment, management monitors the Company arrangements that involve potential counterparty risk, including the custodial risk associated with amounts prepaid to certain vendors and deposits with credit card and other payment processors. Deposits held by our credit card processors at December 31, 2015 and 2014 were $2.9 million and $1.5 million. These balances are included on the Consolidated Balance Sheets in restricted cash in 2015 and 2014. While these balances reside in major financial institutions, they are only partially covered by federal deposit insurance and are subject to the financial risk of the parties holding these funds. When appropriate, we utilize Certificate of Deposit Account Registry Service (CDARS) to reduce banking risk for a portion of our cash in the United States. A CDAR consists of numerous individual investments, all below the FDIC limits, thus fully insuring that portion of our cash. At December 31, 2015 and 2014, we did not have a CDAR balance. Litigation. Tigrent Group Inc., Rich Dad Education, LLC, and Tigrent Enterprises Inc. v. Cynergy Holding, LLC, Bank of America, N.A., BA Merchant Services, LLC, BMO Harris Bank, N.A. and Moneris Solutions Corporation, was originally filed in the U.S. District Court for the Eastern District of New York (No. 13 Civ. 03708) on June 28, 2013, but, due to a challenge to federal jurisdiction, was subsequently recommenced in the Supreme Court of New York, County of Queens (No. 703951/2013), on September 19, 2013. In the lawsuit, we are seeking, among other things, recovery of the $8.3 million in reserve funds withheld from us in connection with credit card processing agreements executed with the Defendant credit card processing entities as well as with Process America (“PA”), a so-called “Independent Sales Organization” that places merchants with credit card processors. The Amended Complaint alleges that the Defendants breached their contractual obligations to us under our credit card processing agreements by improperly processing and transferring our reserve funds to PA. We allege that Bank of America and BA Merchant Services are liable for a portion of our total damages arising from these breach of contract claims (approximately $4.7 million), while Cynergy, Harris Bank, and Moneris are liable for the total damages of approximately $8.3 million. We also allege that Cynergy, Harris Bank and Moneris committed common law fraud and negligent misrepresentation by failing to disclose to us the unauthorized processing and transfers to PA notwithstanding their knowledge of the mishandling of funds and of the fact that PA had failed to maintain the reserve funds as required under the agreements. Pursuant to both of these claims, we allege that we are entitled to recover the full amount of our damages, as well as, with respect to the fraud claim and punitive damages. Discovery in the proceeding is complete. Defendants have moved for summary judgment, which we will oppose, and which has not been ruled on by the Court. Tigrent Group Inc. v. Process America, Inc., Case No 1:12-cv-01314-RLM, filed March 16, 2012 in the U.S. District Court for the Eastern District of New York. In this case we sought the return of the $8.3 million credit card merchant reserve account deposit held by Process America, a so-called “Independent Sales Organization” that places merchants with credit card processors. On November 12, 2012, PA filed for bankruptcy protection in the U.S. Bankruptcy Court for the Central District of California (“Bankruptcy Court.”) On December 3, 2012, the Bankruptcy Court obtained jurisdiction of our dispute with PA. On June 21, 2013, the Tigrent Group filed its proof of claim with Bankruptcy Court in the amount of $8.3 million. Tigrent and Tranquility Bay of Southwest Florida, LLC v . Gulf Gateway Enterprises, LLC, Dunlap Enterprises, LLC, Anthony Scott Dunlap, Peter Gutierrez, and Ignacio Guigou , Case No. 11-CA-000342 filed January 28, 2011 in the 20 th Judicial Circuit, Lee County, FL Civil Division. This is a suit brought by the Company and its affiliate, Tranquility Bay of Southwest Florida, LLC (“TBSWF”), of which the Company is the sole member. This suit (hereinafter referred to as Tigrent v. GGE) was brought to enforce the terms of a settlement agreement with the defendants that resolved a prior mortgage foreclosure suit brought by the Company to foreclose on property owned by TBSWF in Lee County, Florida (the “2009 Settlement”). Pursuant to the 2009 Settlement, the Company acquired the membership interest in TBSWF and the defendants made certain representations and warranties, and undertook certain obligations, regarding TBSWF and the property it owned. In the 2011 lawsuit, the Company and TBSWF alleged that the defendants breached the 2009 Settlement Agreement. The defendants and Drevid, LLC, another party to the 2009 Settlement, filed various counter- and cross-complaints against the Company and TWBSF for transferring the real property owned by TBSWF to a third party in 2010, allegedly in violation of the 2009 Settlement. Trial was held in the 20 th Judicial Circuit, Lee County Florida and on August 4, 2014, the Court entered an order entering judgment in favor of the Company and TBSWF on the defendants’ counterclaims and Drevid LLC’s cross-claims and awarding the Company and TBSWF $0.3 million in damages. The Company and TWBSF have filed a motion for its attorneys’ fees and pre-judgment interest on August 7, 2014. On August 8, 2014, the defendants and Drevid have filed Motions to Alter or Amend the Judgment and for New Trial and/or Rehearing. On October 22, 2014, the Court granted our motion for attorneys' fees and prejudgment interest and reserved jurisdiction to determine the amount of such fees and costs to be awarded to us. Also, on October 22, 2014, the Court denied the defendants' and Drevid's motions to Alter or Amend the Judgment and for a New Trial and/or Rehearing. Subsequently, on November 3, 2014, the defendants and Drevid (the “Appellants”) filed a Notice of Appeal with the Second District Court, Case No. 2D14-5190. On February 3, 2016, the Second District Court issued an opinion affirming the trial court’s order. At the same time, the Court awarded the motion for fees on appeal. On March 8, 2016, the Court issued its mandate thereby permitting the fee claims to proceed. In a matter related to Tigrent Inc. et al. v. Gulf Gateway Enterprises, LLC, et al., Case No. 11-CA-000342, as described above, the law firm of Aloia and Roland, LLP has filed a lawsuit captioned Aloia and Roland , LLP v. Anthony Scott Dunlap, Dunlap Enterprises, LLC, Tranquility Bay of Pine Island, LLC and Tranquility Bay of Southwest Florida, LLC, in the 20th Judicial Circuit for Lee County Florida to (i) enforce the terms of a promissory note in the principal amount of $0.1 million allegedly issued by our affiliate, TBSWF, in payment of attorneys fees allegedly owed by TBSWF to the plaintiff, plus interest and late fees through the date of filing in the combined amount of $0.4 million and (ii) to foreclose on a mortgage that placed by Aloia and Roland, LLP on the real property that was owned by TBSWF and transferred in 2010 that was the subject of the Tigrent v. GGE lawsuit described in the immediately preceding paragraph. This mortgage was placed on the real property prior to the Company acquiring the total membership interest in TBSWF. The placing of the mortgage on the real property was found by the court in Tigrent v. GGE to be a breach by the defendants and Drevid of the 2009 Settlement Agreement for which judgment was entered in favor of the Company and TBSWF. The Company is not a party to the lawsuit. TBSWF has defenses in this matter, although there can be no guarantee of a favorable outcome. TBSW has also asserted a counterclaim against both the law firm of Aloia and Roland, LLP as well as Frank Aloia, Jr., individually, alleging the following causes of action: 1) Legal Malpractice; 2) Breach of Fiduciary Duty; and 3) Constructive Fraud. In addition, TBSWF has made demand for indemnification on the Tigrent v. GGE defendants and Drevid, LLC under the 2009 Settlement Agreement. The matter is continuing to proceed towards a likely trial in 2016. Tranquility Bay of Southwest Florida, LLC v. Michael A. Schlosser; Rebecca H. Schlosser; Drevid, LLC; Anthony Scott Dunlap; Kayleen A. Dunlap; Dunlap Enterprises, LLC; GGE, LLC; Peter Gutierrez, and Ignacio Guigou, Case No. 14-CA-003160, filed October 30, 2014 in the Circuit Court of the 20th Judicial Circuit for Lee County, Florida. In another matter related to Tigrent Inc. et al. v. Gulf Gateway Enterprises, LLC, et al. , Case No. 11-CA-000342, as described above, TBSWF seeks a declaratory judgment against all defendants that (i) a promissory note allegedly issued to Michael Schlosser by Dunlap Enterprises, LLC on behalf of TBSWF in 2009 in the principal amount of approximately $2.2 million plus interest through August 3, 2014 (the “First Schlosser Note ”) is invalid and unforceable, (ii) a promissory note allegedly issued to Michael Schlosser by Dunlap Enterprises, LLC on behalf of TBSWF in 2009 in the principal amount of approximately $2.5 million plus interest through August 3, 2014 (the “Second Schlosser Note”) is invalid and unenforceable, (iii) Dunlap Enterprises, LLC lacked the authority to execute both the First and Second Schlosser Notes on behalf of TBSWF, (iv) TBWSF received no consideration for the purported execution of either the First or Second Schlosser Note, (v) that the Schlosser Notes are in fact a consolidation of debt incurred by defendants Anthony Scott Dunlap, Kayleen Dunlap, Dunlap Enterprises, LLC, and GGE, LLC, (vi) all rights to the Schlosser Notes were previously assigned to Drevid, LLC, (vii) the First Schlosser Note was surrendered and destroyed in 2009, and (viii) such other and further relief as deemed just and proper by the Court. The Schlosser Notes were issued prior to the Company acquiring the complete membership interest in TBSWF. Michael Schlosser is affiliated with Drevid, LLC, a party to the Tigrent v. GGE lawsuit described above. The failure to inform the Company and TBSWF of the existence of the First Schlosser Note was found by the court in Tigrent v. GGE to be a breach by the defendants and Drevid of the 2009 Settlement for which judgment was entered in favor of the Company and TBSWF. The Company is not a party to either of the Notes. In addition, TBSWF seeks indemnification from Mr. Dunlap, Dunlap Enterprises, LLC, Mr. Guigou and Mr. Gutierrez under the 2009 Settlement for fees and costs incurred by TBSWF in defending against claims by Michael Schlosser and Rebecca Schlosser under the Schlosser Notes, including damages and prejudgment interest, and any additional relief deemed just and proper by the Court. Drevid, LLC has filed a counterclaim in this action seeking payment from TBSWF under the Second Schlosser Note. TBSWF recently was permitted to amend its complaint to allege fraud and breach of fiduciary duty claims against Defendants Michael Schlosser and Anthony Scott Dunlap. Watson v. Whitney Education Group, Inc. Russ Whitney, United Mortgage Corporation, Gulfstream Realty and Development, Inc. Douglas Realty, Inc. and Paradise Title Services, Inc., first filed September 21, 2007 in the in 20th Judicial Circuit, Lee County, FL, Case No. 07-CA-011207. In this case (hereinafter referred to as “ Watson v. WEG”), Jeffrey Watson (“Watson”) alleged against Whitney Education Group, Inc., a subsidiary of the Company, causes of action for breach of contract, breach of fiduciary duty, violation of Florida’s Deceptive and Unfair Trade Practices Act, breach of contractual obligation of good faith, constructive fraud, conspiracy to commit fraud, declaratory judgment, fraud in the inducement, Florida RICO conspiracy, and federal RICO conspiracy, based upon losses Watson alleges he incurred as the result of his purchase of real property from Gulfstream Realty and Development, an entity affiliated with Mr. Whitney, and with whom the WEG had a student referral agreement. Watson seeks compensatory damages in an unspecified amount, punitive damages, treble damages, injunctive relief, declaratory relief, and fees and costs. The Company is defending and indemnifying Mr. Whitney subject to and in accordance with the Company’s by-laws. WEG has filed a motion to dismiss, which is still awaiting a ruling from the court. In related matters, Huron River Area Credit Union v. Jeffrey Watson/ Watson v. Whitney Education Group, Inc. and Russell Whitney, Case No. 2008-CA-5870-NC and Huron River Area Credit Union v. Jeffrey Watson/ Watson v. Whitney Education Group, Inc. and Russell Whitney, Case No. 2008-CA-5877-NC, both filed June 6, 2008 in the 12th Judicial Circuit, Sarasota County, FL Civil Division. These matters arose out of two mortgage foreclosure actions by Huron River Area Credit Union against Jeffrey Watson (“Watson”), which involve the real property that is the subject of the Watson v. WEG matter, above. Watson filed a cross-complaint against the Company’s Whitney Education Group subsidiary, n/k/a Rich Dad Education Inc., (“WEG”) and Russell A. Whitney, the Company’s founder and former Chief Executive Officer. In his cross-complaints, Watson alleges causes of action for common law indemnity, breach of contract, breach of the Florida Unfair and Deceptive Trade Practices Act, and conspiracy to commit fraud based on the purchase land and improvements in Lee County, Florida from Gulfstream Realty and Development, an entity affiliated with Mr. Whitney, and with whom the WEG had a student referral agreement. Watson is seeking unspecified compensatory damages, punitive damages, attorney’s fees and costs. The Company is defending and indemnifying Mr. Whitney subject to and in accordance with the Company’s by-laws. WEG has filed a motion to dismiss in each case, which are still awaiting a ruling from the court. We are involved from time to time in routine legal matters incidental to our business, including disputes with students and requests from state regulatory agencies. Based upon available information, we believe that the resolution of such matters will not have a material adverse effect on our consolidated financial position or results of operations. We have evaluated significant events and transactions that occurred after the balance sheet date through March 28, 2016 and determined that there were no events or transactions that would require recognition or disclosure in our consolidated financial statements for the year ended December 31, 2015. An evaluation of the effectiveness of the design and operation of our disclosure controls and procedures (as defined in Rule 13a-15 under the Securities Exchange Act of 1934) was carried out under the supervision and with the participation of our management, including our Chief Executive Officer and Chief Financial Officer. As of December 31, 2015, based upon that evaluation, the Chief Executive Officer and Chief Financial Officer concluded that the design and operation of these disclosure controls and procedures were effective. Our management is responsible for establishing and maintaining adequate internal control over financial reporting, as defined in Rules 13a-15(f) and 15d-15(f) of the Securities Exchange Act of 1934, as amended. Internal control over financial reporting, no matter how well designed, has inherent limitations. Therefore, even those systems determined to be effective can provide only reasonable assurance with respect to financial statement preparation and presentation. Further, because of changes in conditions, the effectiveness of internal control over financial reporting may vary over time. Under the supervision and with the participation of our management, including our CEO and CFO, we conducted an evaluation to assess the effectiveness of our internal control over financial reporting as of December 31, 2015 based upon criteria set forth in the Internal Control—Integrated Framework (2013) issued by the Committee of Sponsoring Organizations of the Treadway Commission. Based on our assessment, we believe that, as of December 31, 2015, our internal control over financial reporting is effective. This Annual Report does not include an attestation report of our registered public accounting firm regarding internal control over financial reporting. Management’s report was not subject to attestation by our registered public accounting firm pursuant to rules of the SEC that permit us to provide only management’s report in this Annual Report. b) insufficient internal controls over our information technology systems, which permits unauthorized changes to our financial records to not be prevented or detected in an timely manner, and insufficient redundant back up of our financial records. As of the date of this report, we have implemented additional new procedures during 2015, and subsequently tested those new procedures, to remediate our material weakness pertaining to our revenue recognition policies and procedures and implemented. new processes to ensure that access to financial records in our systems is adequately monitored and properly authorized , thus remediating these previously identified and disclosed material weaknesses discussed above. Information in response to this item is incorporated by reference to our Proxy Statement relating to our 2016 annual meeting of shareholders. The Proxy Statement will be filed with the SEC within 120 days after the end of the fiscal year covered by this Form 10-K pursuant to Regulation 14A under the Exchange Act. 2.1 Agreement and Plan of Merger, dated as of November 10, 2014, by and among Priced In Corp., Priced in Corp. Subsidiary, Tigrent Inc. and Legacy Education Alliance Holdings, Inc. Incorporated by reference to Exhibit 2.1 in the Company’s Form 8-K filed with the SEC on November 10, 2014. 3.1 Second Amended and Restated Articles of Incorporation of the Registrant Incorporated by reference to Exhibit 3.1 in the Company’s Form 8-K filed with the SEC on November 10, 2014. 3.2 Bylaws of the Registrant Incorporated by reference to Exhibit 3.2 in the Company’s Form 8-K filed with the SEC on November 10, 2014. 10.1 Bill of Sale, Assignment and Assumption Agreement dated as of September 10, 2014, by and between Tigrent Inc. and Legacy Education Alliance Holdings, Inc. Incorporated by reference to Exhibit 10.1 in the Company’s Form 8-K filed with the SEC on November 10, 2014. 10.2 Form of Indemnification Agreement Incorporated by reference to Exhibit 10.2 in the Company’s Form 8-K filed with the SEC on November 10, 2014. 10.3 Senior Executive Employment Agreement, dated October 2013, of Anthony C. Humpage Incorporated by reference to Exhibit 10.3 in the Company’s Form 8-K/A filed with the SEC on February 11, 2015. 10.4 Assignment of Executive Employment of Anthony C. Humpage, dated November 10, 2014. Incorporated by reference to Exhibit 10.4 in the Company’s Form 8-K/A filed with the SEC on February 11, 2015. 10.5 Royalty Payment Agreement dated March 15, 2013 (1) Incorporated by reference to Exhibit 10.5 in the Company’s Form 8-K/A filed with the SEC on February 11, 2015. 10.6 License Agreement, dated September 1, 2013 (1) Incorporated by reference to Exhibit 10.6 in the Company’s Form 8-K/A filed with the SEC on February 11, 2015. 10.7 Settlement and Amendment to the 2013 License Agreement, dated April 22, 2014 (1) Incorporated by reference to Exhibit 10.7 in the Company’s Form 8-K/A filed with the SEC on February 11, 2015. 10.8 Supplement to Talent Endorsement Agreement with Robbie Fowler, dated January 1, 2013 (1) Incorporated by reference to Exhibit 10.8 in the Company’s Form 8-K/A filed with the SEC on February 11, 2015. 10.9 2015 Incentive Plan Incorporated by reference to Appendix B to the Company’s Definitive Proxy Statement on Schedule 14A for the 2015 Annual Meeting of Shareholders filed with the SEC on June 16, 2015. 10.10 Form of Registration Rights Agreement Incorporated by reference to Exhibit 10.1 in the Company’s Form 8-K filed with the SEC on June 17, 2015. 10.11 Form of Warrant Incorporated by reference to Exhibit 10.3 in the Company’s Form 8-K filed with the SEC on June 17, 2015. 10.12 + Form of Restricted Stock Award Grant Notice and Restricted Stock Award Agreement (2015 Incentive Plan) Incorporated by reference to Exhibit 10.1 in the Company’s Form 8-K filed with the SEC on July 22, 2015. 14.1 Code of Business Conduct and Ethics Filed herewith. 21.1 List of Subsidiaries Filed herewith. 31.1 Section 302 Certification by the Chief Executive Officer Filed herewith. 31.2 Section 302 Certification by the Executive Vice President and Chief Financial Officer Filed herewith. 32.1 Section 906 Certification of the Chief Executive Officer Filed herewith. 101.CAL XBRL Taxonomy Extension Calculation Linkbase Filed herewith. 101.LAB XBRL Taxonomy Extension Label Linkbase Document Filed herewith. + Executive management contract or compensatory plan or arrangement. Pursuant to the requirements of Section 13 or 15(d) of the Securities Exchange Act of 1934, the Registrant has duly caused this Annual Report on Form 10-K for the fiscal year ended December 31, 2015 to be signed on its behalf by the undersigned, thereunto duly authorized. Pursuant to the requirements of the Securities Exchange Act of 1934, this report has been signed below by the following persons on our behalf of the Registrant and in the capacities and on the date indicated. No annual report to security holders covering the Company’s last fiscal year has been sent as of the date of this report. No proxy statement, form of proxy, or other proxy soliciting material relating to the Company’s last fiscal year has been sent to any of the Company’s security holders with respect to any annual or other meeting of security holders. If such report or proxy material is furnished to security holders subsequent to the filing of this Annual Report on Form 10-K, the Company will furnish copies of such material to the Commission at the time it is sent to security holders.